While most of us would like to dispute this fact, when we compare ourselves physically to the rest of creation, we are found lacking. Many creatures on this planet have developed various physical characteristics that allow them to survive. Wolves have two layers of fur: an outer coat which is dirt resistant and an inner coat which is water resistant. In the winter, the inner coat grows thick, insulating their bodies against the cold. Chameleons have unique skin cells which allow them to change the color of their skin within milliseconds, allowing them to hide from predators or sneak up on prey. Pufferfish contain a lethal neurotoxin which runs throughout their body, discouraging anything from trying to eat it. The advantage that humans have developed over the millennia is our minds. Though our bodies are fragile and unable to handle extreme environments, we possess levels of intelligence, flexibility and imagination which far outstrips any other creature. Our minds allowed us to build robots that could handle the environments in space that our bodies could not. In preparation for the Apollo mission on the moon, NASA developed three types of robotic spacecraft to gather information on the moon: The Ranger, Surveyor, and Lunar Orbiter. From 1961 to 1965, the Ranger Program launched launching nine unmanned spacecrafts in order to photograph high-resolution images of the surface of the moon. The first six failed, either missing the moon entirely or impacting on the surface. After Nasa redesigned the spacecraft, Rangers 7, 8, and 9 successfully captured images of the lunar surface. These images provided valuable information for future landing sites on the moon for the Surveyor missions. The Surveyor Program launched seven unmanned spacecraft from 1966 to 1968. Their mission was to land safely on the moon and provide images and scientific information on the lunar surface, such as its soil composition, temperature readings, electromagnetic properties, and chemical analysis. While a few of the spacecrafts failed the landing and crashed on the surface, five of the Surveyors managed to land safely and provided essential data for the Apollo mission. Around the same time, the Lunar Orbiter Program launched five unmanned spacecraft with the objective of finding suitable landing areas for the manned Apollo mission, as well as provide precise trajectory information that would help us understand the nature of the moon’s gravitational field. All five Lunar Orbiters were deployed successfully and mapped about 99% of the Moon’s surface, locating eight promising landing sites for the Apollo mission. The efforts of all of these robots ended up culminating in the Apollo project, which successfully put a man on the moon on July 20, 1969, making it one of mankind's greatest accomplishments. Years later, in 1992, NASA formed the Mars Exploration Program (MEP). The four main goals of the MEP were to determine if life ever arose on Mars, to characterize its climate, characterize its geology, and to prepare for human exploration of the planet. In order to accomplish these goals, various programs have sent robots to Mars. 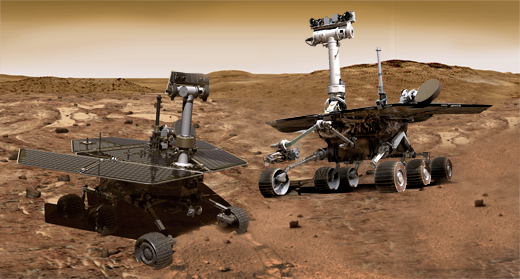 In 2003, two rovers were launched to investigate the surface of Mars as part of the Mars Exploration Rover Mission (MER). The mission's main objective was for Spirit andOpportunity to gather rock and soil samples in order to research the past water activity on Mars. Currently, only the Opportunity rover is still active, as the Spirit rover became stuck in soft soil in 2009 and was unable to continue the mission. An additional rover, Curiosity, was sent in as part of the Mars Science Laboratory Mission (MSL) to research the planet's habitability for microbial life and for future human exploration. The Mars Reconnaissanse Orbiter (MRO) was launched in August 2005. Its mission was to map the surface of Mars and locate potential landing areas for future missions. The MRO was also outfitted with scientific equipment to study the planet’s climate, weather, atmosphere, and geology, as well as look for water in the polar ice caps and under the surface. Originally, the MRO’s mission was supposed to last only two years, but it is currently still in orbit around Mars, continuing to give communication and navigation support for over a decade. While many of the robots on and around Mars have been studying the planet's surface, a new stationary lander, known as InSight (Interior Exploration using Seismic Investigations, Geodesy, and Heat Transport) is planned to be launched in March 2016 and will study the interior of the planet in order to understand the formation and evolution of rocky planets, such as Earth and Mars. Animation of the proposed InSight (Interior exploration using Seismic Investigations, Geodesy and Heat Transport) Lander deploying its instruments. In addition to all of these rovers, landers, and orbiters, two new, humanoid robots may soon be joining future launches to Mars: Robonaut 2 and Valkyrie. The core idea behind the Robonaut was its ability to work with astronauts. It is essentially a robotic torso with a variety of choices for legs, such as a wheelchair-type or the centaur-type, and its design and dexterity allow the Robonaut to wield space tools and work in the same environment as astronauts. The latest version of the Robonaut, R2, has already been on the International Space Station.R2 has been a successful helper on the Space Station, and continues to work with the astronauts, receiving upgrades with every supply drop. Researchers at NASA's Johnson Space Center (JSC), in collaboration with General Motors and Oceaneering, have designed a state-of-the-art, highly dexterous, humanoid robot: Robonaut 2 (R2). R2 was launched to the international Space Station on STS-133. Valkyrie is a battery powered, humanoid robot that looks remarkably like a female Iron Man suit. Loaded with sensors and cameras to observe its surroundings, Valkyrie was working properly until the day of the DARPA Robotics Challenge, when (as luck would have it) nothing seemed to work. It was later determined that a piece of coding was blocking data from the operator to the robot. Despite this setback, NASA remains convinced that robots like Valkyrie will be essential for space exploration, arriving before the astronauts and building the structure necessary for humans to survive in outer space. Yes, humans alone are weak. Humans working alongside robots, however, have endless possibilities.